It was a dry day for India at the 14th Asian Games here with the country failing to add anything to their meagre medal collection so far to slip further down in the medals table after the seventh day of competitions today. Asian Games silver medallists India began their campaign in women’s hockey on a disastrous note losing 0-2 to a strong China in the opening match of the competition in the Asian Games here today. China’s Hou Xiaolan (15), left foreground, competes with India’s Maimon Sanggai Ibermhal Chanu, right, during the Asian Games Women’s hockey in Busan, South Korea, on Saturday. China won 2-0. It wasn’t the brightest start to our campaign here. A 0-2 loss to China has not gone down well with our team, which was so enthusiastic after our triumph at the Commonwealth Games at Manchester. India’s Shiv Kapur surged back into joint lead with a superb three-under 69 in the third round of the individual golf competition in the 14th Asian Games here today. Kapur, currently pursuing studies in the USA enjoyed a two-stroke advantage going in to the second day but squandered it by carding two above par. Faced with a stiff competition, Indian shooters failed to pick up a medal for the second day running in the 14th Asian Games here today though they did come quite close to a bronze medal at the Changwon International Shooting Ranges.The team comprising Satguru Das, T Pallangappa, and A P Subbiah turned out to be the best performers for India today finishing fourth in the men’s 50 m rifle prone team event. The trio aggregated 1772 points to finish seven points behind bronze medal winning Kazkhastan team. Defending champions Iran reached the last eight of the under-23 soccer tournament at the Asian Games after a 1-1 draw with Qatar today gave them top spot in group E and eliminated their opponents. Iran play either Kuwait or North Korea in the quarter-finals on Tuesday depending on the result of today’s later group F game between those two teams. Opener Wavell Hinds cracked a swashbuckling 147 as the visiting West Indian side ripped apart the Board President’s XI bowling to take a 66-run first innings lead on the second day of the three-day match here today. Handpicked by captain Sourav Ganguly, veteran speedster Javagal Srinath was today included in the Indian squad for the first two Tests against West Indies while 19-year-old leg-spinner Amit Mishra of Haryana made an entry into the national team for the first time. The Board of Control for Cricket in India (BCCI) has asked Sahara India to return as sponsors of the Indian cricket team, BCCI president Jagmohan Dalmiya said here today. Pakistani tearaway Shoaib Akhtar grabbed five wickets in 15 balls to cause a dramatic Australian collapse in the first cricket Test here today. Australia, comfortably placed at 74 for one in their second knock, slipped to 89 for seven before being shot out for 127 in 39.5 overs at tea on the third day. Set a victory target of 316, Pakistan will begin their chase tomorrow morning after rain washed out the entire last session. Earlier, leg-spinner Shane Warne took seven for 94 but failed to prevent Pakistan from saving the follow-on in the morning session. ONGC moved into the finals recording a convincing 85-run victory over Bishnoi XI in the second semifinal of the ninth All-India J.P. Atray Cricket Tournament at the Punjab Cricket Association Stadium here today. Put in to bat first, ONGC scored 248 for the loss of nine wickets in the stipulated 50 overs. Bishnoi XI were never in the reckoning and lost by a big margin of 85 runs having been dismissed for 163 runs. Last year’s runners-up Arambagh Krira Chakra of Bangladesh will try to break the jinx in tomorrow’s final of the All-India Governors Gold Cup Football Tournament even though BSF, Jalandhar are considered favourites due to their superb performance in the quarter-final round. Strong contenders JCT Phagwara stayed firmly focused to take a shot at the title when they downed an off colour Punjab State Electricity Board (PSEB) 2-0 while Punjab Police recovered strongly from behind	to scamper past a fighting Gorkha Brigade, Lucknow, 2-1 in the semifinal matches of the 27th All-India Gurdarshan Memorial Football Tournament at The Ripudaman College grounds here today. There will be no foreign participants this year in the Raid-de-Himalaya, India’s toughest, longest and highest motorsports events, beginning here on October 7. As many 18 teams will be competing in the four-wheeler category and 25 in the two-wheeler category. The maximum number of participants are from Delhi and the North East where, motorsports has really picked up over the past few years. Barring a sterling show by pugilist Jitender Kumar and the sailers who kept themselves on course for a medal, it was a day of disappointments for the largest-ever Indian contingent which had its first barren day in this edition after grabbing the gold medal in snooker on October 1. With no medals coming their way, India slipped to the 14th position on the medals table with a tally of just five — one gold, two silver and two bronze medals. 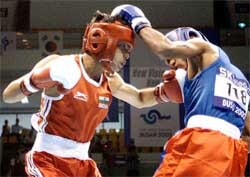 The sailers were the pick of the Indian performers today as they kept themselves on track for securing a couple of medals while pugilist Jitender Kumar moved into the quarterfinals in the middle weight category. The shooters failed to get a podium finish for the second successive day today with the strong Chinese and South Korean marksmen dominating the proceedings at the Changwon International Range. The kabaddi team, which has won the gold medal in all the three editions the sport has figured, set themselves on path for another glory by defeating lowly Bangladesh 37-14 to record their third successive victory. The snooker singles challenge ended with Manan Chandra being eliminated at the quarterfinal stage while Mukesh Rehani also failed to progress beyond the quarterfinals in the nine-ball singles event. The women’s hockey team, gold medal winners in the recent Commonwealth Games in Manchester, began their campaign with a disappointing 0-2 loss to China in the four-team round robin league championship at the Gangseo Hockey Stadium. The shooters, who had claimed as many as 14 gold medals at Manchester, have not been able to make much of an impact in this Games though they were considered as one of the main medal prospects. The team comprising Satguru Das, T Pallangappa and A P Subbiah finished fourth in the men’s 50 m rifle prone event with a total of 1779 points. In the men’s double trap event, the trio of Rajyavardhan Singh, Moraad Ali Khan and Ranjan Sodhi took the fourth position with a total of 375 points. India, who won the Commonwealth Games gold medal recently, failed to live up to the expectations as they were outplayed in all departments by Champions Trophy winners China, who pumped in both the goals in the second half through skipper Chen Zhao Xia. Xia scored the goals through penalty corners in the 38th and 61st minute of the match. India paid dearly for missing several goal-scoring opportunities which included a penalty stroke in the dying minutes which went abegging with Manjinder Kaur messing it up. Though India lost by two goals, the margin could have been much higher but for the Indian goalkeeper and the defenders, who thwarted many moves by the rampaging Chinese inside the circle. Some good show by the defenders and a few smart saves by goalkeeper Tingongleima Chanu denied the opposition the needed space near the goal-mouth as China could convert only two out of total 13 penalty corners they earned. Indians, who had converted almost half of their penalty corners en route to the Commonwealth Games triumph, failed to utilise the three they got today. India next meet South Korea on Monday. India’s coach G. S. Bhangu conceded China were a cut above the rest. “They are a rung above any other team in fray here,” he said. “But we are still in the tournament with two more league matches to go,” Bhangu said. After a barren first half in which Indian captain Suraj Lata Devi and veteran Sita Gussain staved off threatening moves from rival forwards, the Chinese stormed the Indian arena. Their foray was much more purposeful this time and Indian defence found it difficult to stop the nippy Chinese forwards. China with three penalty corners to India’s one in the first half, achieved 10 more in the second half, most of these coming in a space of 15 minutes, clearly showing their dominance in the game. China, who beat Australia in the Champions Trophy held at Macau recently, marked the Indians tightly throughout the match. India did try a few variations but they were dispossessed every time they entered the Chinese circle. India had their brightest chance to score in the last minute but muffed the opportunity. In the melee ensuing after India’s third penalty corner, referee Arnold Michelle showed the dreaded spot for a foul by the Chinese defence. Manjinder Kaur took the strike for India but Chinese keeper Nie Yali read her flick correctly and palmed away the ball. For China Li Shuang showed a lot of promise and seemed to score any time. She combined well with Long Feng and was instrumental in China scoring their first goal in the 38th minute. Li Shuang ran menacingly but was tackled by a defender. The resulting penalty corner saw Xia opening the score for China with a powerful carpet drive. Continuing with their raids on the rival defence, China finally made it 2-0 in the 61st minute, again through a penalty corner conversion from Xia. In another match, South Korea defeated 1998 Bangkok Games bronze medallists Japan 3-2 to stay on track for a fifth consecutive gold medal in the games. But the fact is that the opposition played better than us. They were swifter and stronger and that made the difference between the two teams. Our combination between the midfield and forward-line did not take off though we did make some attempts to create moves in the first session. The Chinese controlled the midfield and resultantly we were not able to take hold of the situation. But I thought our goalkeeper T. Chanu and experienced defenders Sita Gusain and captain Surajlata Devi did a good job. 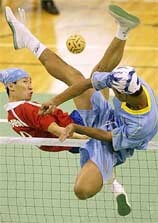 Like they say, a good defence is often more important than a good attack-line to win important tournaments. The tournament is still very much open as South Korea beat Japan 3-2 in a match played later in the day. The top two teams make the final from amongst the four teams in the fray, so if we beat the Koreans and the Japanese, we can still make the final. China, I would say, are sure to make the final. One doesn’t see such a strong team, with a win like the Champions Trophy behind them, lose to any of the other teams in the fray, even though all teams are very strong here. Like I wrote before in my column, it’s the toughest tournament that I’ve ever played in. I only hope that we beat South Korea and do something extra against China in the final. We did not attack well today and scoring goals always counts. Had Manjinder Kaur converted the stroke that was awarded in the dying seconds too, there would have been a psychological boost in the sense that we’d have scored a goal. But alas, that was not to be. We saw South Korea’s game and thought there were quite a few chinks in their armour. They attacked well and scored three goals, but then they also conceded two against a side which can be said to be the least-fancied amongst the four. I certainly fancy our chances against South Korea, who though are the defending champions and have the home advantage. We’ve to work harder, play with more determination. But when there is a more open game, there is a drastic change in our standard. That’s what I hope to see from my team-mates in the coming days. We’d won the silver at the last Asian Games at Bangkok and we should try to maintain that if not do better and win a gold. We’ve to strive to do better and we’ve done that before in not too distant a past. At the Commonwealth Games too we were almost down and out but made a superb bounce-back. Then, the nerve-wracking final against England in which Mamta Kharab got the golden goal. That’s what we’ve to take inspiration from. That’s what we should be aiming to do again. Our immediate need though is to introspect. Where did we go wrong? What do we need to do in the coming days ? China have seen us, but don’t forget we’ve also seen them play. We too have noted down points. Don’t rule us out, we’re still very much in the tournament. India’s Shiv Kapur surged back into joint lead with a superb three-under 69 in the third round of the individual golf competition in the 14th Asian Games here today. Kapur, currently pursuing studies in the USA enjoyed a two-stroke advantage going in to the second day but squandered it by carding two above par. He, however, set things right with an impressive display today to tally a two-under 214 after the three rounds. Kapur shared the lead with Sri Lanka’s Anura Rohana. Kapur now enjoys a two-stroke advantage over his nearest rival and overnight leader H.W. Chang of Taipei with the last and final round to be played tomorrow. If Kapur can manage to keep up the good show tomorrow, he can bring much relief to India’s medal drought. Kapur had birdies on the 1st, 3rd, 5th, 10th, 11th and 14th and dropped a stroke each on 2nd, 4th and 16th holes. Korea’s Kim Hyun Woo, who returned the day’s best card at four-under 68 today, was in joint fifth position with a total of 219. The other three Indians in fray, Manav Das, Keshav Mishra and Harendra Gupta, continued to disappoint for the third day today. Das, who had an identical two-over 74 in each of the earlier rounds, shot a disastrous 12 over 84 to be placed in 26th position with a tally of 232. With a card of two-over 74 today, Mishra occupied the 36th spot with a total of 236 while Gupta returned a dismal eight-over par 80 and was in 41st position aggregating 240. India’s medal chance in the team event has evaporated, though they pushed themselves up by a rung from sixth place to fifth today. 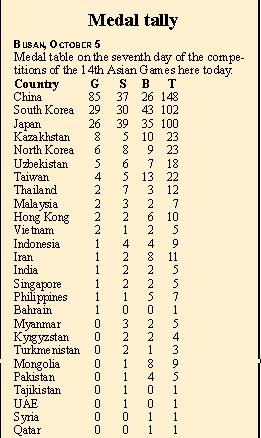 Chinese Taipei led the pack of 16 countries with a total of 650 after three rounds followed by Japan (654), Sri Lanka (664) and Korea (666), while India tallied 676 for the fifth spot. Pugilist Jitender Kumar prevailed over Ismael Faiala of Palestine to move into the quarterfinals and keep his medal hopes alive in the boxing event. Jitender Kumar carved out a convincing 21-7 victory over his Palestinian opponent in the middleweight category to become the second Indian boxer after Mohammad Ali Qamar to romp into the quarterfinals. The lanky Kumar took full advantage of his reach and dominated the bout with a flurry of punches, giving no scope to his opponent to bounce back. The Palestine did manage to score a few points but the Indian was not unsettled by the brief period of assault and maintained his lead till the very end. Commonwealth Games gold medal winner Mohammad Ali Qamar had yesterday defeated Pakistan’s Hafeez Imran 12-1 to move into the last eight in the light fly weight category. Defending champions India thrashed Bangladesh to register their third successive victory and consolidate their position for the gold medal in kabaddi. Maintaining their supremacy right through the contest, India carved out an emphatic 37-14 victory over the hapless Bangladeshis in their league match to keep their winning sequence going in an event which is expected to fetch a gold for the country. The Indians, who have clinched the gold medal thrice in a row, had won both their league matches against Malaysia and Japan yesterday with big margins. The Indians managed four lona points in the first half and got two more in the second session as they had the game under control right through. In the other league matches, Pakistan registered easy victories in the two matches they played today. Faced with a stiff competition, Indian shooters failed to pick up a medal for the second day running in the 14th Asian Games here today though they did come quite close to a bronze medal at the Changwon International Shooting Ranges. The team comprising Satguru Das, T Pallangappa, and A P Subbiah turned out to be the best performers for India today finishing fourth in the men’s 50 m rifle prone team event. 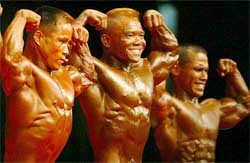 The trio aggregated 1772 points to finish seven points behind bronze medal winning Kazkhastan team. The gold in the event was won by the South Korean team comprising Seung Kyun Kang, Byung Woo Choi and Hyung Jin Nam with a new Asian Games record of 1782 points. The Chinese team of Ye Yao, Weiyi Wang and Jian Qiu took the silver medal with a total of 1780 points. In the men’s double trap team event, the Indian trio of Rajyavardhan Singh, Moraad Ali Khan and Ranjan Sodhi finished sixth. They logged 375 points which was not good enough to take them to the medal podium. Korea’s Yoon Kyun Jung, Byoung Jun Kim and Jung Hwan Park claimed the gold in the event with a total of 418 points while the Chinese trio of Binyuan Hu, Bo Li and Shuangchun Li secured the silver medal with a total of 413. Defending champions Iran reached the last eight of the under-23 soccer tournament at the Asian Games after a 1-1 draw with Qatar today gave them top spot in group E and eliminated their opponents. Iran play either Kuwait or North Korea in the quarter-finals on Tuesday depending on the result of today’s later group F game between those two teams. Both have six points, but Kuwait need only a draw as they have a slightly better goal difference. Hosts South Korea, China and Thailand have already qualified while India and Oman, who have completed their group matches, still have a chance of going through as the best two runners-up depending on the results of Saturday’s late games. Japan are also virtually assured of qualifying because they lead group D by three points and have a superior goal difference to Bahrain, who face Palestine, and their opponents Uzbekistan. Iran, who rested veteran striker Ali Daei, had midfielder Ali Badavi to thank for the point they needed to qualify as group winners. He equalised on 34 minutes when he pounced to fire home from 15 metres following a scramble in the penalty area. Qatar had taken the lead two minutes earlier at the Masan Sports complex when defender Ibrahim Abdula Al-Ghanim diverted the ball into the net off his backside after a left-wing cross. Qatar could have gone in front before that when a centre from midfielder Wesam Rizik Abdulmajid was turned against the post by Iranian defender Saeid Lotfi as he tried to cut out the cross. Qatar looked lively as they pressed for a second goal after the break but Iran’s goalkeeper Mohammad Nosrati was alert to any danger and made several fine saves to keep the scores level. The visitors plundered 321 runs from 90 overs today to finish the second day at a commanding 341 for two with Chris Gayle and Ramnaresh Sarwan also making handsome contributions. Hinds struck 17 fours and three sixes in his 187-ball knock before falling leg before wicket to left-arm spinner Murali Kartik. At close, Sarwan was batting on 93 with 13 fours and one six in the company of Shivnarine Chanderpaul, who was on 20. The home team, who had declared their first innings at 275 for eight yesterday, had just two successes in the day with off-spinner Sarandeep Singh accounting for Gayle, who made 62 runs, and Kartik claiming the prized scalp of Hinds. Resuming at their overnight score of 20 without loss, the West Indians were well served by openers Gayle and Hinds who flayed a spineless bowling attack to score at a very brisk pace. They put on 128 runs for the opening wicket before Gayle, who hit eight fours and one six during his 122-minute stay at the crease, was caught by Sanjay Bangar at covers. The hard-hitting Gayle had struck a six off Sarandeep on the previous ball but he was out while attempting to repeat that shot. The fall of Gayle failed to deter Hinds as he continued batting in aggressive fashion and hit Bangar for two consecutive fours. He followed it up with two boundaries and a six off Sarandeep in an over as he raced to his fifty. The tourists took lunch at 151 for one with Hinds unbeaten on 73 and Sarwan on seven. The two returned after the break to haunt the Indian bowlers with their aggressive stroke- play in the second session. Hinds reached his century in the post-lunch session when a misfielding by Laxmipathy Balaji allowed him to take three runs against Amit Mishra when only one should have been allowed. Sarwan also batted sensibly and continued the good work of Gayle. He reached his 50 off 110 balls, hitting eight fours. The West Indians did not lose any wicket in the second session while adding 106 runs to their total. The inclusion of Srinath in the 14-member team formalises the return of the speedster to Test cricket after a brief retirement. Srinath, who had announced his retirement from the longer version of the game immediately after the completion of India’s tour of West Indies in June, changed his decision following persistent requests from Ganguly. Cricket Board secretary S.K. Nair, who announced the squad here, said Srinath had written to the BCCI making himself available for the series against West Indies. Srinath, who intended to concentrate on next year’s World Cup, was not selected for the tour of England and the Champions Trophy in Sri Lanka. But he was summoned for the final of the Champions Trophy to replace an injured Ashish Nehra. Nehra, who has been recovering well from that injury, has also been included in the squad but asked to undergo a fitness test prior to the first Test starting in Mumbai on October 9. The second Test is to be played in Chennai from October 17 to 21. Haryana leg-spinner Amit Mishra, currently playing for the Board President’s XI in the three-day match against the West Indians, is the only new face in the squad while a significant omission is that of wicketkeeper Ajay Ratra. The national selectors, who met under the chairmanship of Brijesh Patel, picked 17-year-old Parthiv Patel ahead of Ratra. While Shiv Sunder Das has been retained in the side, the other specialist opener Wasim Jaffer has been left out following his indifferent performance in England. Apart from Jaffer and Ratra, medium-pacers Ajit Agarkar and Tinu Yohannan are the other members of the 15-member Indian Test team in England who have been left out of the squad. Coach John Wright was present at the selection committee meeting here. For 19-year-old Mishra, this is the first call to the national squad. “I was expecting to be named in the squad. But it still is a great feeling. I am very happy to be included in the side,” Mishra said. The ICC had ruled out the sponsorship of Sahara in the ICC events on the plea that it was in conflict with its sponsor South African Airways. A number of logo options even with different product categories were sent to ICC but these were not accepted by ICC. Barely a couple of days before the Champions Trophy, Sahara withdrew as sponsors due to which the Indian team played the tournament in Sri Lanka without any sponsor’s logo. “In the best interest of sports BCCI has requested Sahara to reconsider their decision and return to cricket sponsorship,” Mr Dalmiya said. “It is not the question of money or getting an alternative sponsor, but it is the question of patronage and support that Sahara has offered to cricket over the years that prompted BCCI to appeal,” he explained. Pakistani tearaway Shoaib Akhtar grabbed five wickets in 15 balls to cause a dramatic Australian collapse in the first cricket Test here today. Australia, comfortably placed at 74 for one in their second knock, slipped to 89 for seven before being shot out for 127 in 39.5 overs at tea on the third day. Set a victory target of 316, Pakistan will begin their chase tomorrow morning after rain washed out the entire last session. Earlier, leg-spinner Shane Warne took seven for 94 but failed to prevent Pakistan from saving the follow-on in the morning session. Starting the day at 210 for five, still needing 58 to make Australia bat again, Pakistan survived an anxious first hour before being all out for 279 in their first innings. Akhtar, nicknamed the Rawalpindi Express, sliced through the middle-order in a sensational burst that included removing the under-pressure Waugh twins for zeroes in three deliveries. Akhtar finished with five for 21 from eight overs, while off-spinner Saqlain Mushtaq claimed four for 46. 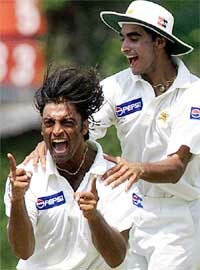 “I will consider this my best bowling only if Pakistan wins the match,” Akhtar said. There was no hint of the drama to follow when Matthew Hayden and Ricky Ponting negotiated both pace and spin to lift Australia to 74 for one midway through the post-lunch period. Working up lightening speed, Akhtar began the destruction by forcing first-innings centurion Ponting to play onto his stumps after making seven. 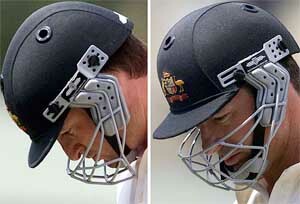 Mark Waugh, battling to retain his place in the Test team, went first ball as Akhtar’s yorker crashed into his wicket. Captain Steve Waugh barely survived the hat-trick delivery, the edge missing his stumps by a whisker, but could not escape the next which crashed into his pads. A fourth wicket fell at the same total of 74 as Hayden (34) was given out caught at silly point off Saqlain Mushtaq by Indian umpire Srinivas Venkataraghvan. FoW: 1-2, 2-4, 3-45, 4-75, 5-116, 6-219, 7-239, 8-267, 9-274. 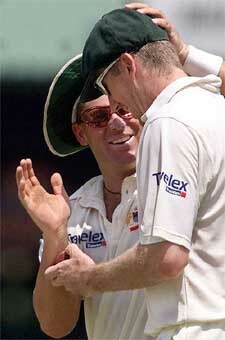 Bowling: McGrath 15-3-40-1, Gillespie 12-2-55-1, Lee 11-3-49-1, Warne 24.3-7-94-7, M. Waugh 3-0-20-0. FoW: 1-61, 2-74, 3-74, 4-74, 5-74, 6-85, 7-89, 8-107, 9-112. Batting first, ONGC lost opener Gagan Khoda and Mithun Minhas quite early in the innings. While Khoda was trapped lbw by medium pacer Doda Ganesh, Minhas edged seamer J.P. Yadav’s delivery taken behind the stumps by Vijay Dahiya. Sandeep Sharma, normally a hard-hitting batsman who relishes going after the bowlers from the word go, played a mature innings. Eschewing all flamboyance and aggression he preferred to anchor the innings and stuck to his task. He was aided well by Amit Sharma and both the batsmen added 117 runs for the third-wicket stand. When Sandeep fell to the guiles of former India off-spinner Nikhil Chopra he had contributed 65 to the total, while Amit was earlier sent back by left-arm spinner Sonu Sharma after he had scored 50. Skipper Rizwan Shamshad took over after the departure of both these batsmen and played a swashbuckling knock of 53 off 41 balls during which he struck five boundaries before he became second victim of Chopra. Chopra then wrapped up the tail as ONGC scored 248 runs. Chopra finished with a satisfying haul of five wickets conceding 43 runs. Bishnoi XI, having an impressive array of batsmen in their batting line-up, came a cropper chasing this total. They lost wickets sooner than expected and capitulated without much resistance. After medium pacers Sanjay Gill and Amit Bhandari made early inroads claiming the crucial wickets of Vijay Dahiya and in-form Rashmi Ranjan Parida, left-arm spinner Rajeev Rathod struck a double blow claiming J.P. Yadav and Tejinder Singh, reducing their rivals to 39 for four. Bishnoi XI never recovered from these losses. Though Nikhil Chopra played a 38-run cameo which included two towering sixes and one four and Narendra Negi contributed 28, the efforts were good enough only to delay the inevitable. Minhas claimed the last four wickets to emerge the most successful bowler from the side as Bishnoi XI were skittled out for 163 runs. Dronacharya awardee D.P. Azad gave away prizes to “man of the match” Sandeep Sharma, “best allrounder” Nikhil Chopra and Tejinder Singh for taking the “catch of the match”. ONGC will clash with Punjab Colts in the final to be played tomorrow. The Bangladesh team, who had conceded four goals against Kolkata giants Mohun Bagan in last year’s final, were eager to undo the history in tomorrow’s encounter at the Baichung Stadium here, 80 km from Gangtok. Arambagh’s skipper and custodian Saifuddin, who saved a few briliant shots in the tie-breaker of the semi-final to take his team into the final, would be expected to lead from the front in tomorrow’s encounter as well. The burly security men having an edge over the opponents for their physical strength.They displayed a scintillating brand of soccer in the quarter-final against Tollygunge Agragami of Kolkata. After conceding three goals till the 85th minute of that match, the way BSF men bounced back in that quarter-final game to equalise and then defeat the Kolkata boys in the tie-breaker impressed one and all. BSF, a mix of both youth and experience, has Tejendra Singh who was in the national squad earlier. The team would bank on his expertise in tomorrow’s match. The Bangla team defeated Tata Football Academy by a solitary goal in their maiden quarter final outing before reaching the semi-final round. The Arambagh boys then edged out the Kolkata Port Trust in a 3-1 tie-breaker to set a title clash with the security men. The Jalandhar outfit, which began thier campaign in the tournament from the pre-quarter final stage, first clashed with Bhutan XI to come out victorious by 3-2. In the quarter final encounter BSF men took on Kolkata’s Tollygunge Agragami and grounded them in a shootout (7-6) after forcing a 4-4 draw during the regulation and extra time. BSF then fought with compatriots Punjab Police in the semifinal and beat them by a solitary goal to confirm a berth in Sunday’s match. The millmen started on a disadvantageous note with two of their star players not playing taking the field. I.M Vijayan is recovering from an injury while Joe Paul Ancheri is donning India colours at the Busan Asian Games. However, despite being without the services of both these key players, the millmen started with a flourish and minutes into the first half the smooth flowing Hardeep Gill nearly found the target but saw his shot going out of play after hitting the woodwork with the goaltender Jatinder Singh beaten all ends up. The mill men kept up the pressure, raised their games a couple of notches and this was evident from the manner in which the PSEB castle came under tremendous strain. During this period, the mill men went ahead when Harwinder (senior) received a defence splitting pass from Hardeep Gill. Harwinder sold the keeper a dummy and after sending him the wrong way, gently careressed the ball home. There were periods during the end of the first half when the powermen could have equalised but their strikers, particularly Parminder and Sukhvir, were too wayward in their shooting. Moreover, the powermen found the JCT goalkeeper Arvind Kumar standing like a wall between them and their endeavour to win. Keeping in view the high stakes involved, for both teams caution was the key element. Notwithstanding the inherent strength of the mid-field, where the spotlight was held by Hardeep Gill and Jaswinder Singh,the millmen stretched their defensive posture a little more than necessary. Even during this period, the powermen seemed to have lost their way and little precious was done by their strikers, who, it may be said, were starved off some good passes by the midfielders. During the fag end of the second half, Jaswinder Singh settled the issue when his one-two with Ram Pal culminated in the former sending in a rasping shot from the top of the box. Earlier, Punjab Police were stunned by fifth minute goal by Gorkha Brigade striker Bijendra Thapa whose stinging shot beat the cop’s custodian, Balwinder Singh. The Lucknow team went on the offensive but the defensive phalanx put up by the cops withstood all the pressure. Midway in the second half, a Lucknow defender took the ball on his hand in the box and off the resultant penalty, Paramjit equalised. Balwinder Singh made the scoreline 2-1 in his team’s favour when he collected a neat through pass from Gurinderpal Singh and after side stepping his way past two defenders neatly placed the ball in the net. There will be no foreign participants this year in the Raid-de-Himalaya, India’s toughest, longest and highest motorsports events, beginning here on October 7. As many 18 teams will be competing in the four-wheeler category and 25 in the two-wheeler category. The maximum number of participants are from Delhi and the North East where, motorsports has really picked up over the past few years. Mr Manjeev Bhalla, secretary of the Himalayan Motorsports Association, said the travel advisories issued by the USA, Canada and some other countries in view of the prevailing situation in India and Pakistan discouraged foreign competitors. He said keeping in view the tragic mishaps which claimed the lives of three motorsport enthusiasts, including Mark John of England, the organisers have scaled down the event considerably and taken several other measures to cut down the risk factor. The duration of the event has been reduced to four from seven days and the total length of rally from 3000 km to 1600 km. Accordingly, the competitive section has been reduced to 578 km from 1400 km. The night stages have been eliminated altogether and servicing of vehicles has been banned after 11 PM to ensure that participants had enough rest during the rally. As per the international motorsport regulations, six hours rest is mandatory after 12 to 20 hours of driving. During the raid driving hours will not exceed 12 hours on any day and the competitors would have nine hours of rest.